Landscape has everything to do with who Coloradans are and thus how they cook, eat, and drink. Ruggedness is a given: the cowboys and outlaws of the old Wild West have their modern-day equivalents in chefs and back-to-the-land enthusiasts who forage for forest mushrooms when they’re not tending to their beehives and chicken coops. This sense of adventure and emphasis on locally-sourced ingredients is imparted on every plate served in Denver and Boulder’s restaurants and eateries. Combined with a spotlight on cooking traditions from around the world, the Front Range dining scene has never felt so exciting and vibrant, all the while set against a singular backdrop: the Rocky Mountains. Denver & Boulder Chef’s Table gathers the cities’ best chefs and restaurants under one roof, featuring recipes for the home cook from over fifty of the region’s most celebrated restaurants and showcasing full-color photos of mouth-watering dishes, award-winning chefs, and lots of local flavor. Beginning her career in Boston at the turn of the millennium, Ruth Tobias is a Denver-based food-and-beverage writer, assistant editor at Sommelier Journal, and author of the blog Denveater. 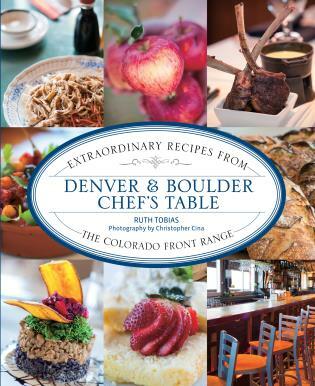 She is also the author of Food Lovers' Guide to Denver & Boulder (Globe Pequot Press).